You have received a formal invitation to the Holistic Visions Symposium. Le Ciel Foundation would like to thank you for your interest. In November 2017, twelve spiritual elders from different wisdom traditions around the world gathered at the United Nations in New York for the first Council of Twelve and Above. Together they established a new spiritual framework for humanity to reconnect with nature, with itself and with our spiritual essence. The framework works as a new operating system that allows us to co-create and implement durable and deep changes within our society’s perspectives and behaviours. These twelve elders are Aama Bombo from Nepal, Rita Pitka Blumenstein and Marie Meade from Alaska, Julieta Casimiro from Mexico, Aba Gebrewahid from Ethiopia, Kgomxoo Tixhao and Kgao Qame from Botswana, Mamo Evangelista from Colombia, Hiroyuki Aoki from Japan, Barbara Gibson-Thorpe from Australia, Floriza Pinto from Brazil, Lyudmila Khomovna from Siberia, Phra Kru Samatah Vikrom from Thailand and Atome Ribenga from Gabon. 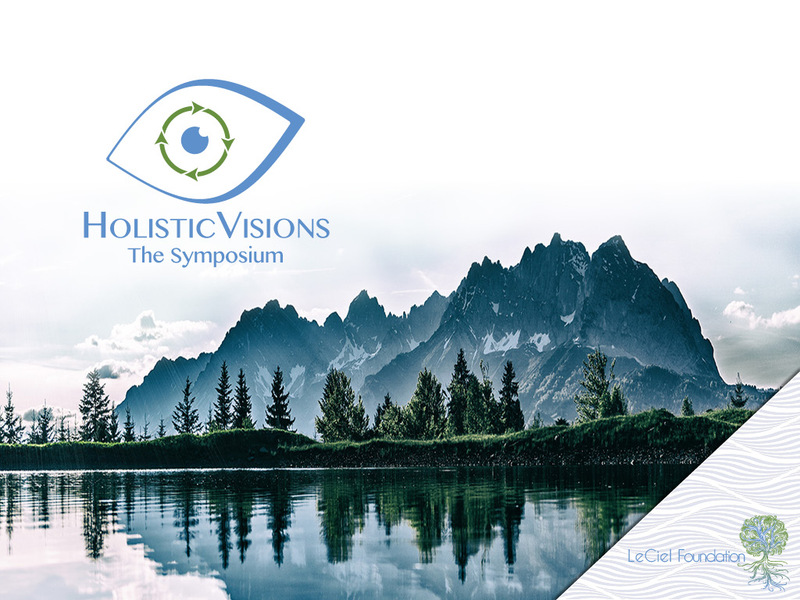 Recognising and leveraging the interconnectedness of humanity’s challenges, the Holistic Visions Symposium is the first initiative to consciously operate within this new framework. We will focus our efforts and spiritual tools on 13 solution-oriented workshops and will generate new solutions that together will have the potential to initiate a global paradigm shift. We hope that you will be an active part of this initiative and confirm your presence. You can do this by filling out the form at the bottom of the page. We are looking forward to having you on board, and to start working together in early September. We are a London-based not-for-profit organisation, born from an understanding that our collective global problems have emerged from humanity’s disconnect with Nature and with its spiritual essence. We believe that this fundamental separation between our ‘global society’ and a higher purpose is at the root of our dehumanised, apathetic and destructive modernity. Our mission is help find solutions to the environmental and social crises humanity is currently facing by introducing spiritual technology to the way we tackle our challenges and connecting timeless wisdom traditions with contemporary strategies for innovation. 1 - Why Me ? You have also been invited because there is a strong chance that the objectives and methods of this symposium will resonate with you more than with others, that you have already felt a longing to make a real difference to the lives of others and to the planet, and that you will respond positively to this call and the invitation to participate. 2 - How will I benefit from participating ? This event is a lot more than just a conference. It can be a fully transformative experience. You will have the opportunity to meet some of the most inspiring, dedicated and innovative people on this planet. You will work alongside each other and co-create something much more significant than anyone could create by themselves. In doing so, you will be supported by several spiritual masters, members of The Council of Twelve and Above. They offer the spiritual and energetic framework that will allow all participants to be in flow and fully interconnected, and all workshops to achieve their greatest potential and go beyond what could be expected. What you will experience will allow you to acquire new perspectives. For the first time you will be part of a group that addresses problems and their root causes as a fully interconnected set of challenges and solutions. You will be active in a virtuous circle where every solution to one problem is part of the solution to another one and you will be able to embrace the world and your life in its full multi-dimensionality. 3 - Where and when is the symposium going to be? The Holistic Visions symposium will be held in Chateauform’ Campus La Mola, Cami dels Plans de Can Bonvilar s/n, 08227 Terrassa, Spain (30km from Barcelona) from November 29th to December 2nd 2018. 4 - What are the fees to attend the symposium? The symposium itself is free of charge, however participants who can afford it will be asked to cover their own travel, accommodation and personal expenses. As a foundation, our intention is for the event to be as accessible as possible and to have a positive impact on humanity’s future. All people working for and with the foundation on this initiative are volunteers. Participants will come from all corners of the world, from different cultures and backgrounds. Their ability to contribute and share their unique perspective is the only thing that matters. As we are obtaining financial support from private backers to cover the costs of organising the symposium, we aim to offer a limited number of bursaries to participants who would otherwise not be able to attend. We need and welcome new supporters. If you would like to donate and contribute to the success of the symposium please click here. If you would like to apply for a bursary to participate, please tick the relevant box in the participant’s questionnaire. Hotel costs, travel costs and any other service you would like to benefit from during the symposium are participants’ responsibility. Hotel costs are €1,000 from Thursday 29th to December 2nd (3 nights , 3/4 days) and include accommodation, food, unlimited soft drinks and beer, wine for dinner, free access to fitness and spa facilities. If you choose to be accompanied by someone an extra cost of €120 per night and per person will be added for hotel and food. Please note that companions are not able to attend or participate in workshops. 5 - What is exactly expected of me as a workshop participant? That you will identify, together with other workshop participants, a solution, concept or programme that will be developed in the run up and during the symposium. That you commit to collaborate and stay connected with other members of your workshop in the 3 months leading up to the symposium. That you fully join physically, emotionally and spiritually in the intention and the principles driving the symposium. That whether you are an innovator, an investor or an influencer you take full responsibility of your domain to deliver, with your other workshop members, a viable solution, concept or programme, that will be fully financed and ready to test within 6 months to a year after the symposium. That you participate in the process fully and solely driven by collective results and change, not self-interest, ego, fame or recognition. 6 - When do we actually start working and what is the timeline? Members of all workshops will be introduced to each other digitally in late August. They will work together from September to December in order to be ready to take the final decisions during the symposium. Every workshop will be coordinated by a Workshop Facilitator who will make sure the synergy between members is optimal and workflow and focus are stable and constant. They will also ensure that all options and solutions are considered within each workshop and that they are also in tune with solutions developed by other workshops. Members from workshop n°7 (Spirituality) will develop a spiritual framework to support all other workshops energetically and offer spiritual technology so that each workshop is guided to the best possible ideas, solutions, and modes of interaction. 7 - How will the work be organised? Work will take place between participants through private multimedia platforms and groups. Regular exchanges will take place via email, online chats, audio and video conferences. A clear work timeline will be developed by the Workshop facilitators. At the same time Workshop facilitators will report weekly about their progress to all other Workshop facilitators so that all workshops are interconnected and take into account other issues and ways to weave them into their own solutions. 8 - What will happen during the symposium? During these 3 days of gathering, every workshop will take the final decisions regarding the solution/programme they will adopt, finance and test. Once final decisions have been made, and solutions/programmes are agreed upon, the roles and responsibility of every member for the following 6 months will be defined through a protocol that all participants will formally agree to. They will then present the results of their work to the rest of the symposium participants. 9 - What will happen after the symposium? After the symposium, each workshop team has 6 months to 1 year to implement a test version of the solution/programme. Teams will test regularly, adjust solutions/programmes if necessary to ensure a successful outcome and optimal results at the end of the testing period. A year after the symposium, final solutions are tested and monitored. Those judged viable and scalable will be shared fully and openly with the world and the public in an open source way, using creative commons and insuring they cannot be hijacked through private intellectual property. To move forward with your registration we are going to need a little more information about yourself, please be so kind as to fill all fields below and submit your details by clicking on the submit application button at the very bottom.